The credits rolled. ‘So, what did you think?’ I asked my friend. This observation of First Man is a pretty accurate one. First Man is a biopic of Neil Armstrong (played by Ryan Gosling): the first man on the Moon. It starts from the time he first joined NASA until the Moon landing and offers an insight into how his job affected his personal life – especially with his wife (being played by Claire Foy). The film is directed by Damien Chazelle, of La La Land fame. I’ve heard a lot of people compare this film to the Apollo 13 film from 1995 and it certainly does have some similarities. They both focus on one person and how they react and work under the pressure of the plot. Their main difference, I believe, is how the films tell their stories to the audience. For instance, take a rocket launch scene. 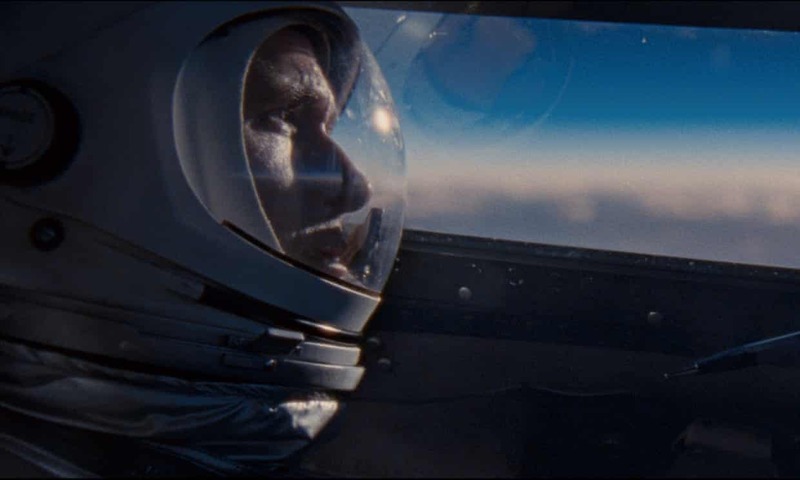 In First Man, the camera is fixed in the cockpit. The camera rattles as the rocket threatens to tear itself apart under the strain of the engines. We focus on the astronauts faces as they’re simply praying to live; not knowing if the rocket will explode. The only way the audience knows they’re getting closer to space is through a tiny cockpit window slowly becoming darker and darker. The aim here is clear: it is incredibly immersive. You almost feel that you’re in that cockpit, feeling the intensity of that rocket launch. In comparison, In Apollo 13, we see the engines ignite and the camera pans about the rocket. We take in the awe of the launch and its immensity. We know we’re seeing something spectacular, but we don’t so much feel that we are in it. We’re more like observers. I much prefer First Man’s approach to this, and scenes like this are where the movie shines for me. Unfortunately, the entire film can’t be launch scenes and rocketry. The pacing is certainly all over the place from scene to scene, and the movie is very guilty of throwing dates and locations at you. It is supposed to span from 1961 – 1969 which is a long time to cover and it shows in the film. Many characters die, and there are a lot of funeral scenes, but unless you’re super in-the-know about the space race, you don’t really know who anyone is and it’s a little confusing and hard to be invested in them. In some cases, they are simply used to show how their deaths affect Armstrong, which is a waste of characters in my opinion. Overall, I would say this is a great film. Lots of intense, immersive scenes, with outstanding performances by Ryan Gosling and Claire Foy. It does, however, have some pacing issues as well as a lack of side character development which can lead to a lack of investment. Screening dates for First Man at the GFT can be found here. The GFT also offers a free 15-25 discount card to students, available here.